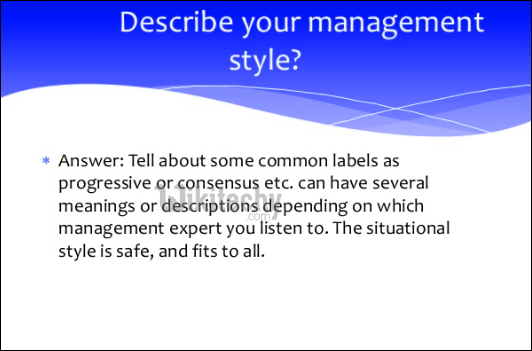 What is your style of management ? Home HR Interview Questions and Answers What is your style of management ? To judge your ability to solve problem. To understand who are you and what you bring to table. To test whether you have an answer to all. If a company is hiring all freshers, they would need a strong-minded and experienced manager who can lead by other employees. If the management position is within an already established department populated with experienced workers, they would require a manager who can cooperate/collaborate with them and ensure that nothing comes in their way when they are working. Your answer could be you are willing to change and not fixed with a set technique. You must make the interviewer understand that they are getting someone isn’t adapted in their beliefs. And they are getting someone that is thoughtful and analyzes each situation for its properties. Related Searches to What is your style of management ?